Something that was once unusual is becoming increasingly common: obese toddlers. The scary fact is that obese children tend to stay obese right into adulthood. Clearly if you want to keep your child healthy in these sedentary times you have to take action – do something! One good thing you can do is get your toddler a climbing toy. Not sure what that’s about? Don’t worry. In the following post, we’ll delve into more details about the climbing toys, how they can help your toddler, and the top 10 climbing toys on the market today. 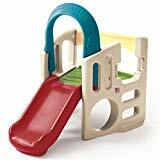 Climbing toys are fun structures made for your young toddler to help them learn how to climb so as to improve their motor skills, strengthen their muscles, and help them with their balance and coordination. It also helps with their imagination and social skills when they play on the climber with other children. There are climbers of all sorts, and some do not just involve climbing. Some incorporate crawling through a tunnel. The most fun ones end in a slide so the child is rewarded for their effort with a joyful slide – preferably into a ball pit, if you can arrange that. 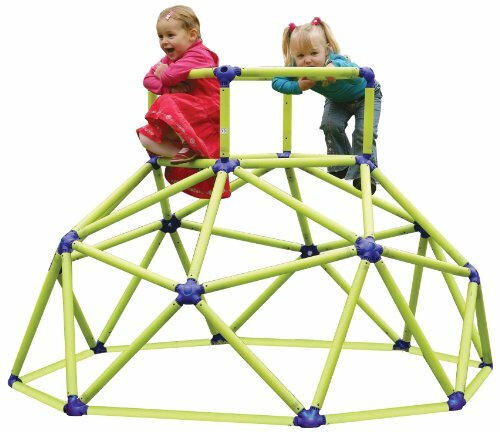 Some climbing toys are shaped like a tree house, some like a mountain, and some are structures that consist of interconnected bars. There are indoor and outdoor climbing toys. Some are suitable for either location. The larger ones are usually made for outdoor use and the lightweight ones are indoor climbing toys for toddlers. Some climbers are made of plastic, and these are usually lightweight. Those made of heavier materials like steel are not as portable. Most climbers require assembly. 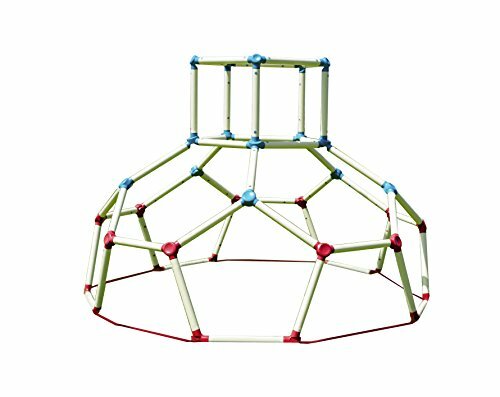 If you have little kids, the Lifetime Geometric Dome climber is one of the best climbing toys for toddlers. It is an outdoor climbing toy which features a geometric design that has real rock climbing hard grips for your kids to hold on to. Several kids can enjoy the jungle gym at the same time. It will help your children strengthen their muscles and develop their coordination. 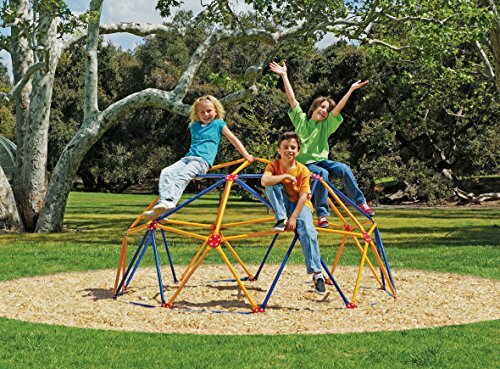 It’s a firm, durable jungle gym made of powder-coated steel that is weather and rust-resistant. 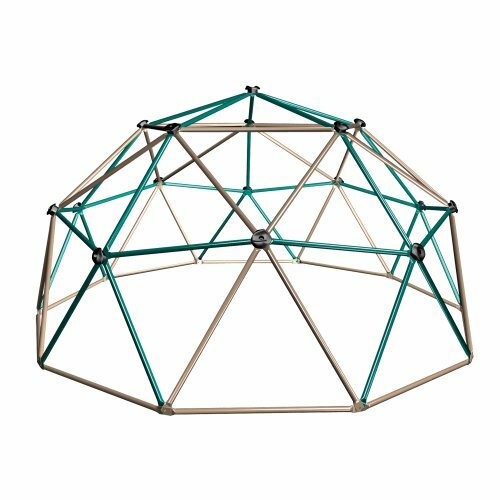 It’s a sturdy dome which you can have fun putting together. One user even added a small swing in the middle, and the dome still holds. You can also hang up a hammock inside it just to make it even more fun. It’s also stable. A user who lives in a windy area reports that in spite of daily strong gusts of wind, the dome does not budge. The stability of its architectural design is impressive. The thick paint coating on the steel bars protects this toddler climbing toy from other sorts of weather like rain that would cause rust. The coating also protects it from solar heat, if you live in very sunny areas. It keeps the bars from getting too hot. 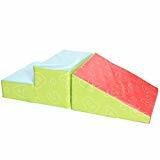 This indoor climbing toy for toddlers features two pieces made of soft yet firm polyurethane foam. The first piece is shaped like stairs – toddler stairs which only feature two steps that your child can safely climb. The second piece is a ramp that starts where the stairs end, so once your child has climbed they can easily slide down. The two pieces are connected with Velcro strips which are on the four sides of each piece. 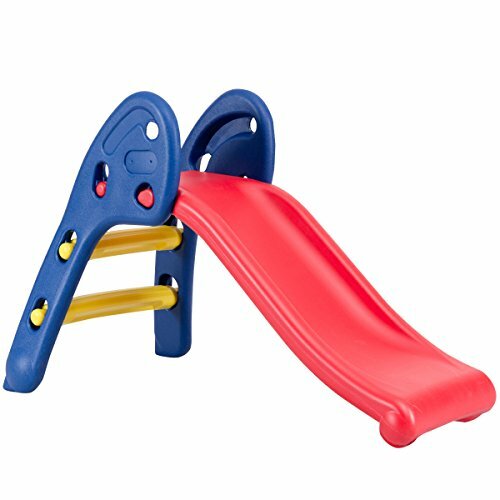 This climbing toy and slide is great for playrooms, classrooms, or even your home. Children who play on it get to improve their motors skills and become more active. It is soft and has no sharp corners that could poke your precious toddler. It’s only one foot high. The slide down is so short that the little one will get no bumps, only a fit of the giggles. It’s also quite light and easy to pick up and move it to another room. Kids will be kids, and they might spill something on the climbing toy. Fortunately, the vinyl cover is water-resistant, ensuring liquids do not soak through. It’s also easy to clean with a damp cloth and soap. This is another of the best climbing toys for toddlers. Your little ones can use it both indoors and outdoors. It’s made of plastic, so it is light and portable enough to take outdoors. Your kids can enjoy it all year-round – indoors when it’s cold and outside in summer. The monkey bars consist of interlocking plastic tubes and connectors which have double self-locking springs. It is lightweight and assembly is easy enough. The monkey bars are also very sturdy. The plastic has some flexibility, but that only enhances its durability – and it does not bend. Kids of 3 to 6 years can have a wonderful time playing on it in your backyard. Outdoor use shouldn’t worry you – the plastic has been enhanced with protection against the harsh UV rays of sunlight. This improves the durability of the climbing tower. Another advantage is that since it is made of plastic, it is less likely to get too hot for your kids to play on when you take it outdoors into the sun. 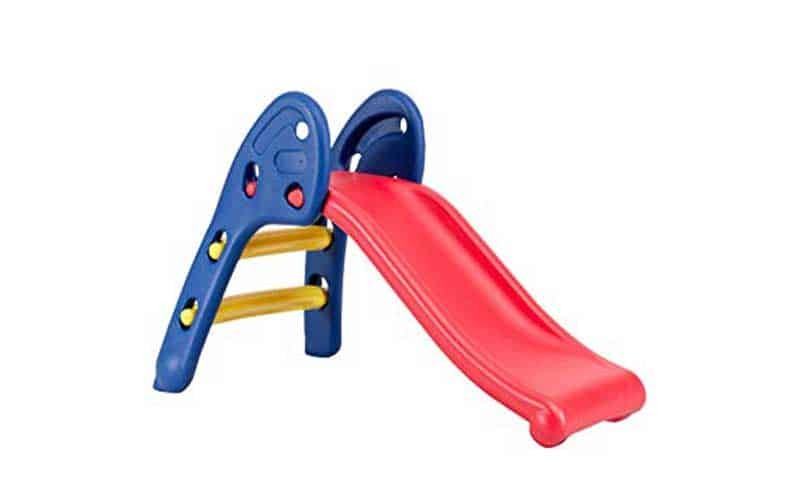 This toddler climbing toy is fun for little kids between 9 months and 3 years old to play on indoors. It consists of 5 foam shapes. The structures are made of dense foam. The individual pieces each have a non-slip bottom to ensure they stay stable and in place even as kids play around with them. It’s worth pointing out that they do slide when placed on carpet or hardwood. The play set will help your toddlers develop gross motor skills like crawling and climbing. They can also slide. This will keep the kids active, healthy, and happy. The pieces have soft covers you can easily clean by wiping with a mild solution of soap and water. The covers are also very colorful, so children will really love them. Though soft, this is a quality product. When your child steps on it, they will barely leave an impression as the foam set will be quick to regain its shape. Here is a versatile climber toy that children can enjoy playing on in the house. It is an all-in-one toy that will require your child to participate in more than one fun activity. They will crawl in the crawl-through tunnel, climb on the stair holes, stand on the platform, and slide down the slide with glee. For safety, the platform has a safe rail that will enclose your child to ensure they don’t fall when they are climbing. The climbing toy is not very large. If you want something that several children can play on, this might not be it. Only about one or two can play on this at the same time. It is recommended for children aged 18 months to 5 years. Here is yet another of the outdoor climbing toys for toddlers. It is shaped as a dome and made of steel bars. The steel is rust and UV-resistant so it is safe to keep out of doors in all sorts of weather. 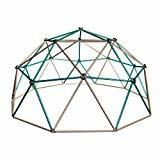 The dome is also very sturdy and should give your kids years of good enjoyment. The maximum capacity it’s supposed to handle is 1000 pounds. It sits on the ground and is easily moveable whenever you want to mow the grass or rearrange your outdoor furniture. You can also stake it to the ground if you wish, but that is not necessary as it is already quite stable. The dome is appropriate for children of 3 to 9 years. Several kids can play on it at the same time. This is how children develop their sociability and improve their motor skills: by climbing or swinging on the bars. Playing on the toy will help strengthen their limbs and enhance their balance and agility. If you have kids who are about 18 months old to 6 years old, this is a great slide to get them. The children can use it both indoors or outdoors. They can play on it indoors at night or in cold weather and enjoy it in the sun on days when the weather is nice. Like most toys of this type, it requires assembly. Fortunately, you will not need any tools to assemble. Not only that – you will also need no tools to fold it down when you want to put it away for storage or move it from one place to another. If you want to be innovative and give your kids maximum enjoyment, this slide is excellent for a ball pit. The toddlers would climb its little ladder then gleefully slide into the ball pit. The slide is designed to handle one kid at a time, with a weight limit of 60 lbs. This is the best toddlers climber in this review. Kids whose parents buy them this climber are really lucky. It is designed in the shape of a mountain, so your toddlers feel like little explorers when they are climbing – and you know how active the imaginations of children can get. The “mountain” has four sides and a peak. The four sides all have holes in them or spaces your kid can use to climb to the top. Each of the sides has a unique surface – since none of the sides look like the other, the kids have different climbing experiences to enjoy. There is a hole at the peak, so your child can put their head through it, declaring victory. The victor’s reward is the flag on top. This climber is much higher than the others we have looked at, and therefore dangerous for younger kids. It’s recommended for children of age 4 to 8 years. At most, you can have 4 children on it – the maximum weight is 320 lbs. At the foot of the mountain is a sturdy cargo for the kids to step on to give them a leg up as they start to scale the climber. The mountain has nine hand grips placed at strategic locations for the kids to hold on to when making their climb. This climber features bars made of sturdy plastic tubes. These tubes are more flexible and safer than steel tubes. The dome is protected against the UV rays of sunlight, and so the children can play on it outdoors. You can also have the children play on it indoors. The dome’s size is in that sweet spot where it’s not too big for the kids to get hurt if they fall off, nor is it too small. Your kids will be safe climbing it, hanging from it, swinging on it, or using it as a den to play in. It will help them become more agile and get the exercise their little bodies need. It is best for children of ages 3 to 6 years. 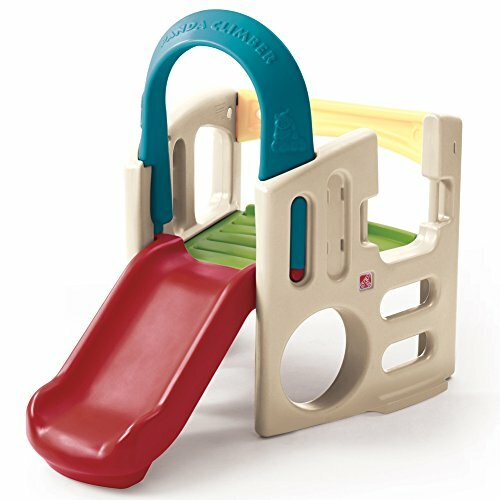 The Costzon Folding Slide is last in our list of toys for toddlers to climb on. It is made of non-toxic PE material that the kids will slide on. It can handle up to 110 lbs. The slide is intended for children between the ages of 3 years and 8 years. It has multiple bright colors that will look attractive to your toddler. 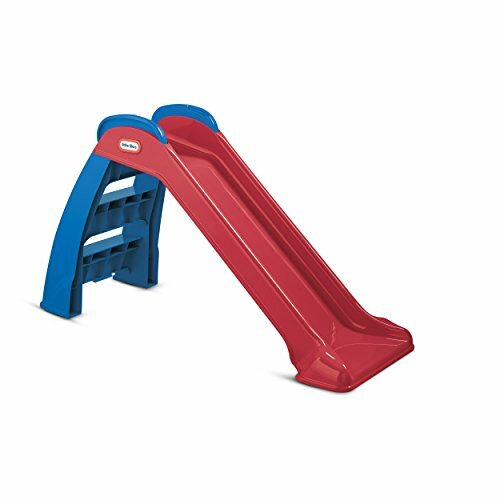 The slide is smooth, the slope gentle, and the steps easy to climb. The entire slide is smoothly connected, featuring no edges, so your child is safe and in no danger of getting poked. The children can play with the slide indoors. You can also take it outdoors whenever you want. It’s lightweight and easy to move from one location to another. Furthermore, you can also fold it down when you want to keep it in storage, and you will not need any tools to do that. Climbing toys can only handle so much weight. They usually specify the maximum weight or age they can allow. There are climbers that are so light and small that they would be unsuitable for older children who are like 6 year olds. The climber should be big enough to give your child a sense of challenge and adventure, but also not so big that it becomes scary to imagine them falling off it. You can calculate whether your children are too many for a climber by adding up the weights of your children and comparing the total with the maximum weight capacity provided. Keep in mind that, like most companies, the seller or manufacturer might be overgenerous with the number and the maximum weight capacity could be lower than the one provided. This question inspires more questions. For instance, do you have enough room in your house for a climbing toy? Do you own a backyard where your children can play? What is the weather like in your area – is it too cold for little children to spend too much time outdoors? Do you have storage space in your house or compound for the climbing toy? Based on your answers to these questions, you can determine whether you need an indoor or outdoor climbing toy. The material a climbing toy is made of will determine its weight. For instance, steel climbers are heavier than plastic ones. This affects portability. If you want something you can easily transport from one location to another, the plastic toy would be more attractive than the steel one. The material also affects durability. Some materials break easily. Some are susceptible to weathering. Choosing the right material might be what determines if your kids will enjoy the climber for a long or short time. Climbers are a clever way to get your child exercising so as to keep them healthy and strong. While climbing, the child will lose his or her baby fat, build their muscles, and strengthen their bones. They hold on to the bars using their hands and in this way develop their upper body strength. They climb using their legs and in this way develop their lower body strength. Children are highly imaginative, and when given something fun and challenging to do, they form a compelling narrative about what they are doing. 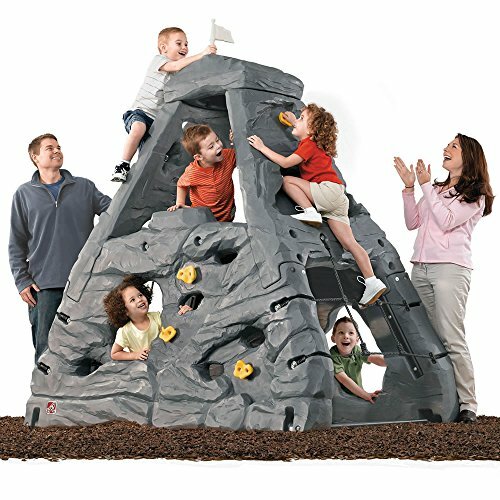 A climber, being an interactive toy which draws active participation from the kids, will inspire their active imaginations. Climbing is one of the best ways to enhance your children’s sense of balance. When a child develops good balance and coordination, they can be more involved in sports and feel more confidence while navigating the world. The child is also less likely to suffer injury. Climbing also helps a child develop the gross motor skills. These are running, walking, lifting, kicking, and throwing. Motor skills relate body awareness, balance, reaction speed, and strength. Clearly this will prepare a child to be more athletic later on. When children are playing together on the climbing toy, they start to develop social skills. They form their own little society with its own rules and norms. Whenever you have a play date with some of the other parents, the kids can play together and socialize on the climbing toy. Don’t leave your child’s health and development to chance. Mold it, guide it. In this review, you have learnt about all sorts of climbers, from indoor to outdoor climbing toys. 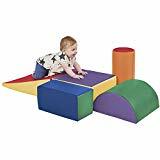 With this information, and the ten great choices at your disposal, it should be easy to pick the best toddlers climber and gift it to your child as a surprise.